Chippenham midfielder Rob Dean has been given £1,000 from a supporters' club collection to help pay for his recovery from a career-threatening injury. He dislocated a knee, twisted his tibia and ruptured ligaments in an abandoned game against Hungerford last month. In Monday's return fixture, he was presented with a cheque from fans, the club's board and reserve team, as well as a games console from his team-mates. 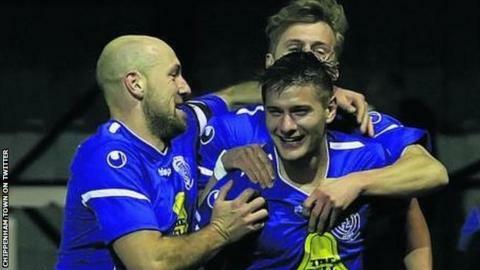 "The fans have been really good," the 24-year-old told BBC Wiltshire. "They raised a lot of money for me and it's been put aside for rehab, so I can have more sessions with a private physio. Hopefully that will help in the long term." The incident occurred on the half-way line after a tackle by Hungerford's Ian Herring, a former Bluebirds player, for which he received a red card. A first response ambulance tended to Dean, and it was during this treatment that referee Reuben Simon called the game off with the score at 0-0. The player was treated on the pitch for 45 minutes before being taken to hospital, where he remained for two weeks. "What caused the problem was a bad touch by myself," Dean recalled. "I remember reaching out for the ball to side-foot it forward. The lad came into the tackle from the side and my leg was stuck there. "It was one of those typical tackles you see all the time. It was the follow-through that did it. All I remember then was a shattering pain, and it felt like my leg had snapped. "I was looking at the other players and I could tell by their reaction it was bad. A lot of them were walking away, and if I was in that situation I'm not sure I'd want to see it." Dean, who plays part-time for Chippenham while also working for a bank, was told after his second reconstructive surgery that his footballing career may be over. But he remains positive he can return to the field for the non-league club. "The doctors said it was unlikely I'd play again and their focus is to get me back doing day-to-day activities and get me back to work. "It was hard to hear that and I realised I had to just get back walking again. "But you never know, surgeons are proved wrong and I'll do all I can to give myself a chance to get back [playing]."